The potential of halotolerant algae isolated from natural resources was used to study CO2 fixation and algal lipid production. Biological fixation of CO2 in photobioreactor in presence of salinity is exploited. The CO2 concentration 1060 ppm gave the highest biomass yield (700 mg dry wt/l), the highest total lipid content (10.33%) with 80% of CO2 removal. The world population has been growing rapidly and has nearly doubled in the last fifty years. This rapid growth has been accompanied by economic development both of which have resulted in high energy demand. Fossil fuels, coal oil and gas have been the major sources which have supplied this energy demand for a long time. However limited availability of these sources coupled with the adverse environmental impacts associated with their extraction and use have prompted the search of other renewable energy sources to meet the future energy demands. Several renewable energy sources such as solar, wind, hydel and biomass energy systems are in various stages of development and their applications are steadily increasing. However, one of the sources, which has attracted considerable attention in recent years is the biofuels such as bioethanol and biodiesel. Biofuels can play an essential part in reaching the target to replace petroleum based transportation fuels and in reducing CO2 emissions, in environmental and economic sustainability are considered carefully . First generations of biofuels, which have attained economic levels of production, have been mainly extracted from food, oil crops and animal fats using conventional technology . Second generation of biofuels have the potential to use waste residues and make use of waste land thereby promoting rural development and improve the economic conditions of developing countries. The most promising second generation biofuel is biodiesel from algae which is capable of using CO2 and sunlight to produce a variety of organic molecules, particularly, carbohydrates and lipids. These photosynthetic organisms are known to produce high biomass yields with high oil content which can be cultivated in fresh water or wastewater . Another advantage of algae is their ability to tolerate and adapt to a variety of environmental and nutritional conditions. The most positive impact is the utilization of atmospheric CO2 which can have a significant benefit in the context of global warming. However, the water demand for algae is as high as 11-13 million liters/ha/day for cultivation in open pond . Their ability to grow in fresh water, municipal, industrial wastewaters and sea water not only overcomes this hurdle but also provides treated wastewater for other uses. Unlike other sources of biofuels, algae have the capability to produce different types of biofuels. This multiproduct paradigm of algae makes it an ideal candidate for the concept of biorefining which involves production of many products from a raw material. The products produced from algal biomass are listed in Table 1. Considering the advantages of algae as a biofuel the present work investigated their effectiveness in CO2 sequestration. This paper discusses the effectiveness of a halotolerant algae for CO2 sequestration in a laboratory scale photoreactor with potential to produce biodiesel. The algal culture was isolated from an agricultural runoff using the medium described by Fiore et al. . The medium has the following composition: (mM): MgSO4.7H2O, 162.3; CaCl2 2H2O, 81.6; NaCl, 684.5; and microelements. The microelement stock containing (mM): H3BO3, 9.25; MnCl2 4H2O,1.82; ZnSO4.7H2O,0.15; Na2MoO4.2H2O, 0.25; CuSO4.5H2O,0.06; COCl.6H2O.,0.03; NH4VO3,0.04 and FeEDA solution 160 ml. The final pH of the medium was 7.8. Cultures were routinely checked for purity by microscopic examination and plating. The pure culture of halotolerant algae was identified as Chlorella sp by 18 S rDNA techque. Algal cultivation was done in photoreactors consisting of 2Lborosilicate glass bottles fitted with rubber stopper. CO2 from a gas cylinder was mixed with air to get desired concentration and bubbled through fine diffuser. The schematic of the experimental set up is shown in Figure 1. The flow rate (20 ml/min) of gas was measured using a rotameter. The photoreactor was irradiated using standard fluorescent lamps (40 w) placed on both the sides. The excess gas was discharged through an out let tube. The inlet and outlet gas samples were sampled at regular intervals and analyzed for CO2. The algal samples were collected from an outlet at regular intervals and analyzed for various parameters. 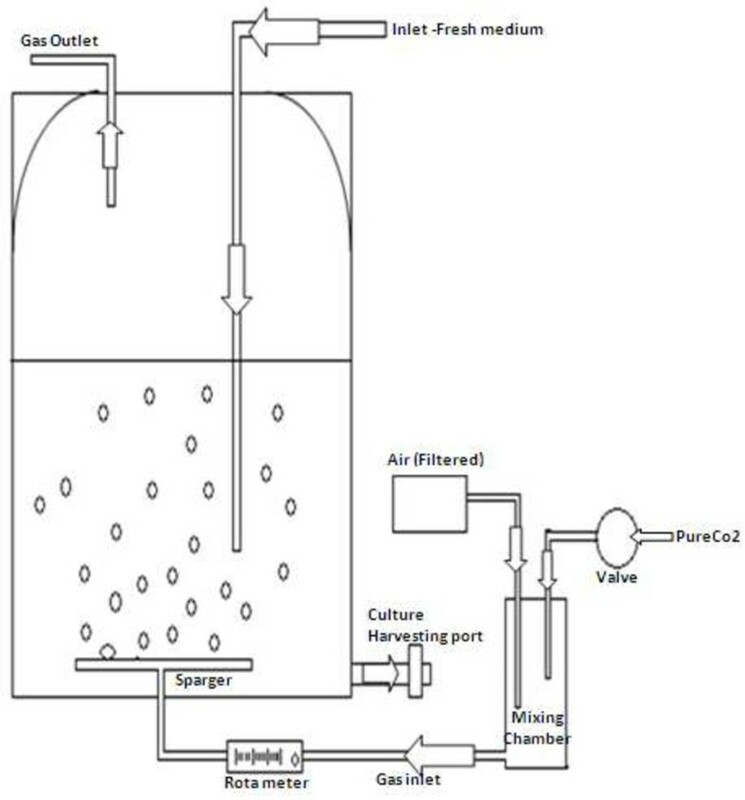 Schematic diagram of lab scale 2L Photo bioreactor. The concentration of algal biomass was measured by measuring the optical density of the algal suspension at 680 nm wave length in a UV-visible spectrophotometer (Thermo Electron Corporation Type UV1, England). The dry weight of algae was estimated from a standard graph. Alkalinity and pH of the suspension was measured. as per standard procedures . Algal cells were harvested by centrifugation (10000 rpm) for 10 min. The cell pellets separated from the supernatant were washed with distilled water and dried. Fifty mg of dried algal biomass was taken in 15 ml of test tube, 1.6 ml of double distilled water, 4 ml methanol and 2 ml of chloroform were added and mixed thoroughly for 30 S. Thereafter, an additional 2 ml of chloroform and 2 ml of double distilled water were added and solution was mixed for 30 S. Following this, the mixture was centrifuged, at 5000 rpm for 10 min. The upper layer decanted and the lower chloroform layer containing the extracted lipids was collected in another test tube. The extraction procedure was repeated again with the residual pellet and both the chloroform extracts were mixed to gather and evaporated till dryness. The dried total lipids were measured gravimetrically and lipid content was calculated as percentage of algal biomass. During CO2 sequestration, algae samples were processed for DNA extraction as method. 18S rDNA gene was amplified using universal eukaryotic primers F5′-GTCAGAGGTGAAATTCTTGGATTTA-3 and R 5′-AAGGGCAGGGACGTAATCAACG-3′ . The PCR conditions were 30 cycles of denaturation at 95°C for 2 min. followed by annealing at 55°C for 2 min. and final extension at 72°C for 10 min. The reaction mixture content 5 ul DNA template, 1X PCR buffer and 5U Taq DNA polymerase to a final volume of 50 ul. The amplified product was resolved on 1.2% (w/v) agarose. Since the objective of the study was to evaluate the CO2 sequestration potential of the isolated halotolerant algae the growth profile was measured at different CO2 concentrations. 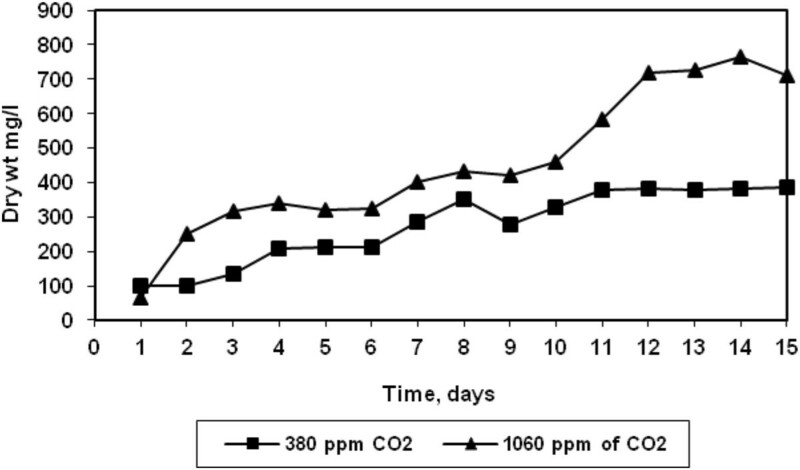 The growth profile of the halotolerant algae at two different CO2 concentrations are shown in Figure 2. At both the concentrations, the growth increased steady with time till 11 days after which a sharp increase in growth was observed for high CO2 concentration (1060 ppm) and stationery stage was reached after 14 days. Similar increase in Chlorella vulgaris growth with increasing CO2 concentration has been reported by Zeng et al. . The lower growth rate of algae at low CO2 concentration may be attributed to insufficient CO2 supply. This is further confirmed from the CO2 removal efficiency at both the CO2 concentrations shown in Figure 3. The halotolerant algae were observed to be more efficient at higher CO2 concentration. The maximum removal efficiency increased from 60% to 90% as CO2 concentration increased from 380 to 1060 ppm. It was also observed that the trends of CO2 removal and growth were similar. Weissman and Tillett reported that microalgae could convert up to 99% of CO2 in solution . Algal growths in presence of CO 2 . CO 2 removals by halotolerant algae. Since CO2 is a weakly acidic gas, it affects the alkalinity of the solution. As seen from Figure 4, it was observed that the alkalinity increased from 60 to 350 mg/l during the growth of algae at both the CO2 concentrations. However, the pH of the solution remained constant throughout the growth at both CO2 concentrations (Figure 5). Rangarao et al. have observed that bubbling of CO2 continuously resulted in decrease in pH of culture solution thereby fall in cell density . Variation in alkalinity during growth of halotolerant algae. Variation in pH during growth of halotolerant algae. Since the algae was isolated from agriculture runoff water containing relatively high salt concentration, the optimal salt concentration required for growth of algae was investigated. 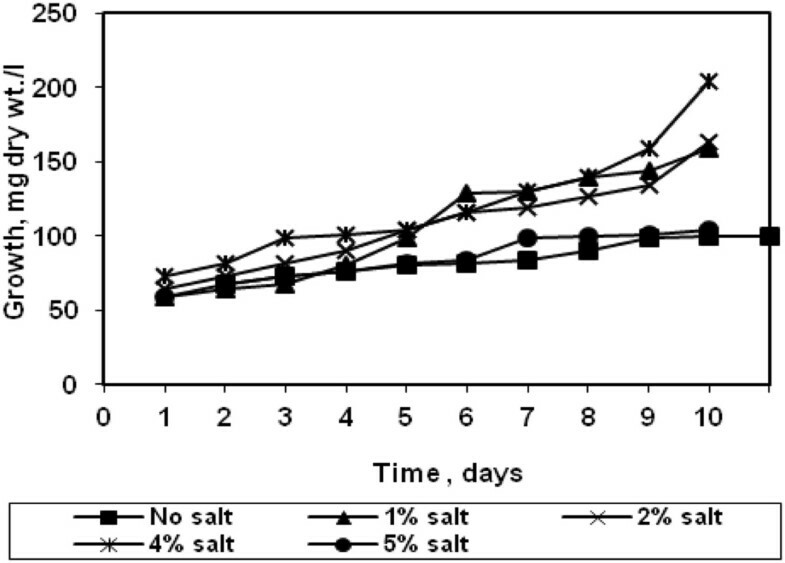 The result presented in Figure 6 show that the algal growth has increased with increased in salt concentration till 4% and it was relatively poor in absence. The removal of CO2 at 4% salt concentration is shown in Figure 7 and almost 80% of CO2 was removed till 11 days. This indicates the salt loving nature of the algae. However, when the salt concentration was increased above 4%, the growth rate decreased which indicates an optimal level for growth. Hence this species is termed as halotolerant algae. There is little impact on CO2 removal efficiency. Effect of salinity on growth of halotolerant algae. CO 2 removal by halotolerant algae at 4% salinity. The halotolerant alga was not only evaluated for its CO2 sequestration potential based on its growth, but also for its potential use as a feed stock for biodiesel. This was determined from the lipid content of the algal cell given in Table 2. It was observed that as the cell growth increased with the time, its lipid content was also increased, with a maximum of 10% in 14 days. However, this is much lower compared with the 20-40% lipid content reported for same algal strains . Liu et al. reported that total lipid contents representing 20-50% of the dry weight were found to be quite common . Go et al., reported 12.2 mg/g/day oil productivity in marine algae Tetraselmis suecica. Higher salinity might be affecting lipid production pathway in algae. A phylogenic study based on 18S r DNA sequencing is one of the most useful methods for inferring relationship between genera or between the species belonging to a genus . The identification of the halotorent strains isolated from the agricultural runoff was done based on DNA elongation using 18S rDNA primers in PCR and by comparison with 18S rDNA sequences of a library of species. Sixteen strains that were reported for CO2 sequestration were collected from NCBI and were used as reference strains for construction of a dendogram presented in Figure 8. They were identified following the BLAST analysis of the 18S rRNA gene sequence and based on >97% 18S rRNA gene sequence similarity, the nine isolates were categorized to two groups comprising of two sub groups. Based on the phylogeny, it was found that these reference strains mainly belonged to the phylum Chlorophyceae. 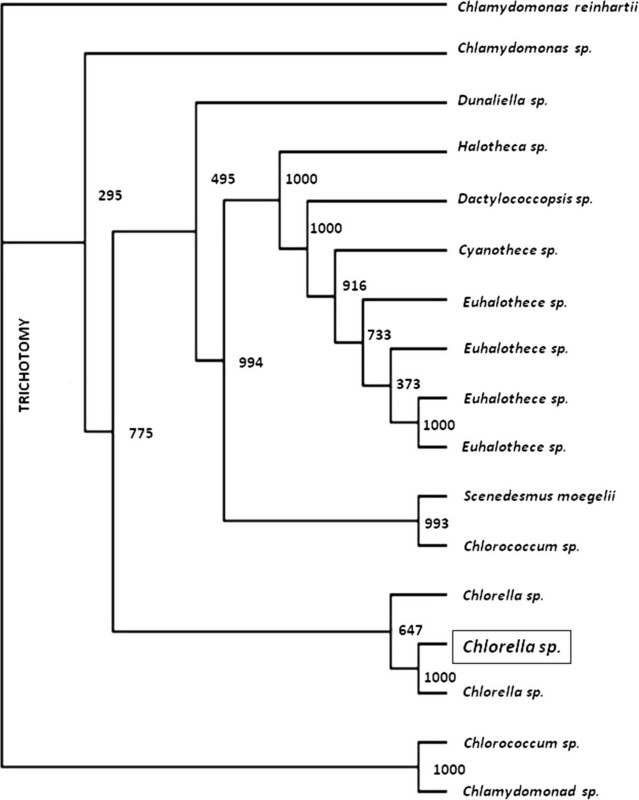 From the nearest phylogenic neighbour of the reference strains showing 100% similarity, the halotolerant algae isolated in study identified as Chlorella species and its gene bank accession no KC492080. Among the thirteen strains, five strains belonged to the family Chlamydomonadaeceae and Chlorococcaceae showing close similarity (64.7%) with that of the neighbour Chlorella sp. (KC166137) that was reported to grow under heterotrophic condition. Dendogram for algae. KC492078 – Chlorococcum, KC492079 - Chlamydomonas sp., KC492080 - Chlorella sp., KC492081 - Chlamydomonas sp., KC218498 - Chlorella sp., KC166137 - Chlamydomonas reinhardtii, KC218488 - Scenedesmus maegelii, KC218482 - Chlorococcum sp., KC218500 - Dunaliella sp., JN934686 - Chlamydomonas sp., AJ000708 - Cyanothece sp., AJ000709 - Euhalothece sp., AJ000710 - Euhalothece sp., AJ000711 - Dactylococcopsis sp., AJ000712 - Euhalothece sp., AJ000713 - Euhalothece sp., AJ000724 - Halothece sp. A halotolerant algal strain was isolated from agricultural runoff and its potential for CO2 sequestration was evaluated. The strain was found to grow well at a salt concentration of 4% and yielded 204 mg/l biomass in 14 days. The cell growth and CO2 removal efficiency increased with increasing CO2 concentration. The lipid content of the algae also increased with time and the maximum lipid content observed was 10%. Based on 18S rDNA technique, the halotolerant algae was identified as Chlorella sp. Authors like to thank Director, NEERI for allowing publishing the manuscript and Department of Biotechnology, New Delhi for financial support. UR contributed in growth measurements, CO2 removal, alkalinity, pH variation studies. BB helps in algal DNA isolation, PCR amplification, and dendogram preparation. SS is overall guide for the R & D work. All the authors read and approved the final manuscript.